How long can Instagram videos be? Well, there are different length requirements for Instagram feed videos, Instagram Story videos, IGTV videos, and Instagram Live. In this guide, we’ve broken down Instagram video length details for all of ‘em. We’ll share the basics first and then dive into the length for each type of Instagram video in more detail below. If you’re posting a video to the Instagram feed (aka your main Instagram profile), videos are limited to 1 minute. You can upload a video that’s longer than 1 minute, but you’ll need to select a 1-minute section of the video. 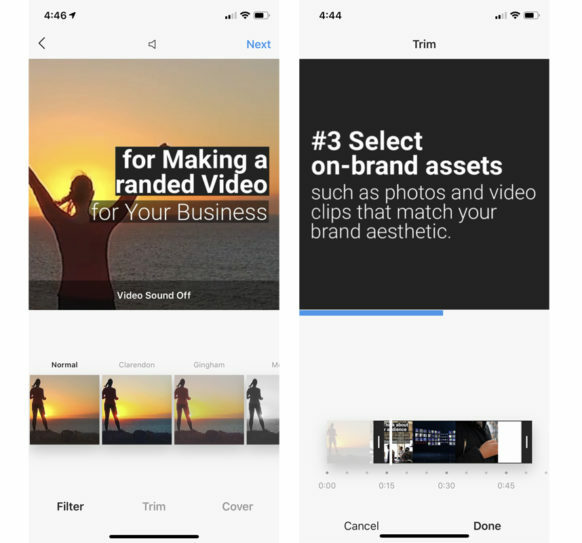 Once you’ve selected your video and tapped "Next" simply tap "Trim" and hold and drag your video until the minute you’d like to use is within the handles. 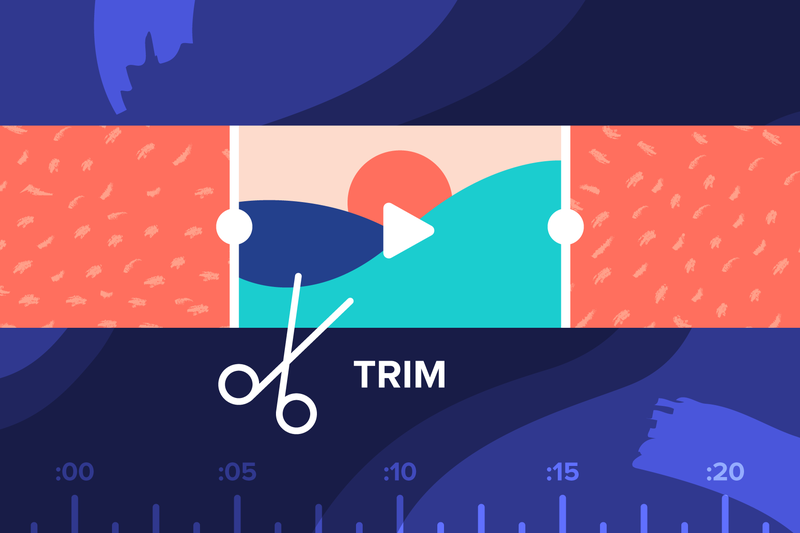 You can also drag the handles on the right or left to crop your video to a selection shorter than 1 minute. If you want to showcase more than 1 minute of video in a post, there is a way to get around the Instagram maximum video length! You can do it by creating a carousel post. A carousel post lets you share up to 10 photos or videos in a single posting, which viewers can swipe through. If you’ve got a video that’s longer than 1 minute, try chopping it up into separate clips, each no more than a minute long. You should be able to do this by editing the video within your phone’s camera roll and saving each section as a new clip. Then, upload the clips sequentially into a carousel post. To create a carousel, tap on the carousel icon (it looks like a couple squares on top of each other), and select up to 10 videos to upload. You can trim and edit each video individually, and change the order of videos, if you want to make more changes once you’ve previewed your carousel. For Instagram Stories, you’ve got a 15-second limit per individual Story. However, if you upload a video that’s longer than 15 seconds, they will chop it into 15-second pieces for you. However, from our own experimenting, it seems you’ll only get four 15-second pieces, so this only works for videos up to 1 minute. 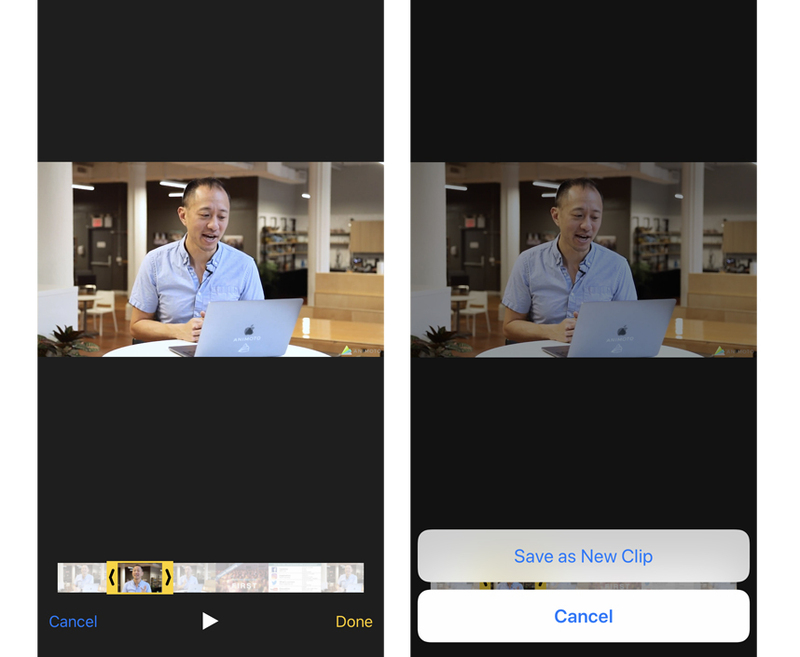 For videos longer than a minute, you’ll have to chop the videos up yourself, which you can do on your camera roll, similarly to what we showed you above. There are also apps that’ll do this for you, like CutStory for Instagram. 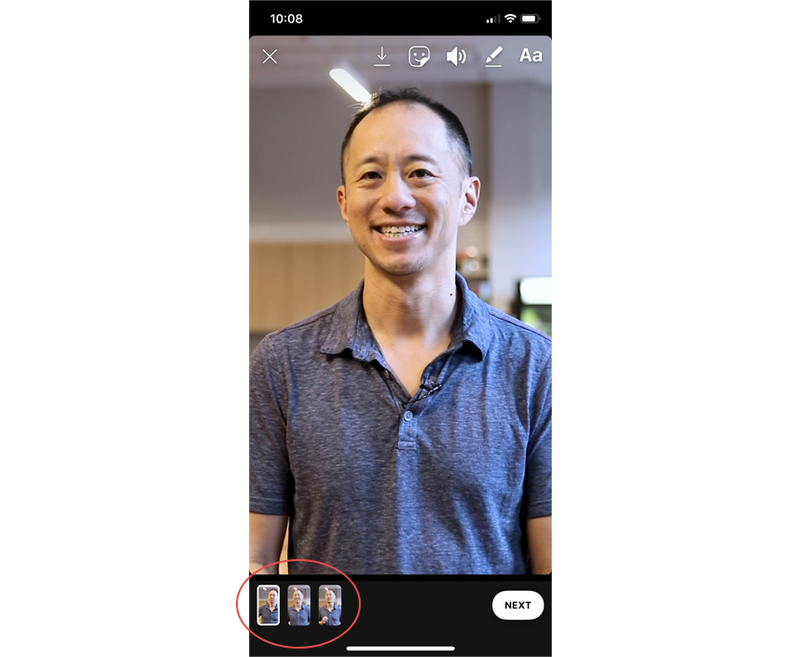 If you’re shooting your Instagram Story live in the Instagram app, you can shoot up to ten 15-second Stories in a single take. Posting to IGTV? You’ll be able to upload videos that are between 15 seconds and 10 minutes long. If your account is verified or you’ve got an account with a lot of followers, the upload limit extends to 60 minutes. Finally, when it comes to going live on Instagram, you’re limited to 60 minutes per live stream. However, when you hit the 60 minute limit, you can go live again for another hour after that… and another and another. Just keep an eye on the time so you’re there to restart when your live session ends. And there you have it! 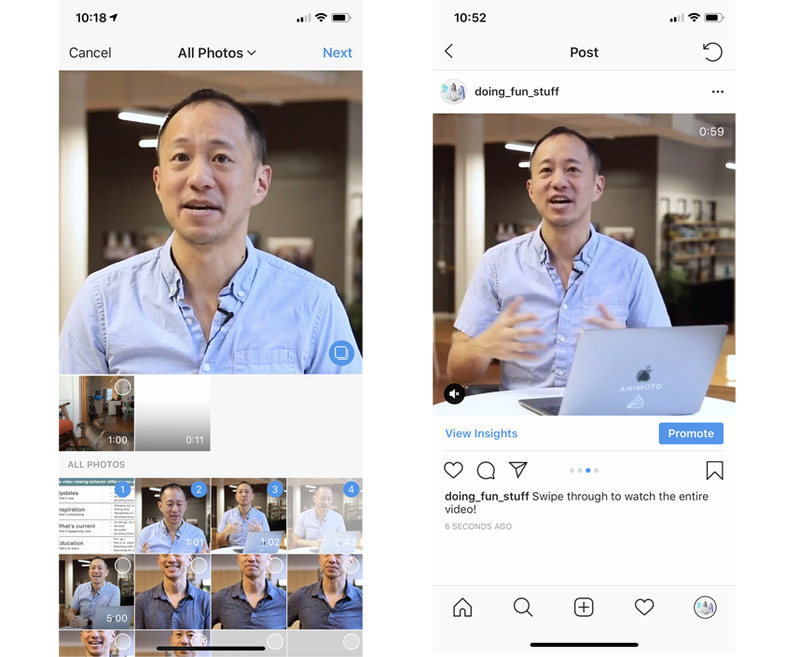 If you’re looking to get started with video on Instagram, find out how you can start making Instagram videos with Animoto and check out our blog post on 5 reasons to use video marketing on Instagram. Happy video making!